A newly invigorated Mitt Romney has been springing joyously along the campaign trail in recent days armed with a slight poll bounce and a brand new campaign slogan: "Clear eyes. Full hearts. Can't lose." Which would be a great, fresh take on quixotic optimism if that were an original Romney joint rather than something he ganked directly from Friday Night Lights. 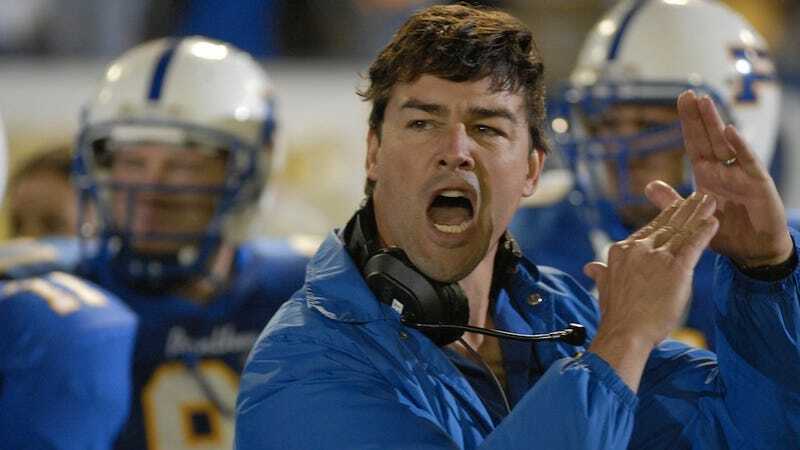 Now, the show's creator has gotten wind that the GOP Presidential nominee is aping Coach Taylor, and he's written Romney a letter demanding that he knock it off. The letter, composed masterfully by writer-director Peter Berg, was obtained by The Hollywood Reporter. In it, Berg informs Romney in no uncertain terms that he's got to cut it out, because, to be frank, Peter Berg thinks that Mitt Romney is kind of a horrible jerk. I created the show Friday Night Lights and came up with the phrase Clear Eyes. Full Hearts. Can't Lose. I was not thrilled when I saw that you have plagiarized this expression to support your campaign by using it on posters, your Facebook page and as part of your stump speeches. Your politics and campaign are clearly not aligned with the themes portrayed in our series. The only relevant comparison that I see between your campaign and and "Friday Night Lights" is the character Buddy Garrity — who turned his back on American car manufacturers selling imported cars from Japan. Your use of the expression falsely and and inappropriately associates "Friday Night Lights" with the Romney/Ryan campaign. Mitt, we all wish you and your family the best. We are grateful for your support of our beloved show, but we are not in any way affiliated with you or your campaign. Please come up with your own campaign slogan. Mitt Romney just can't win.